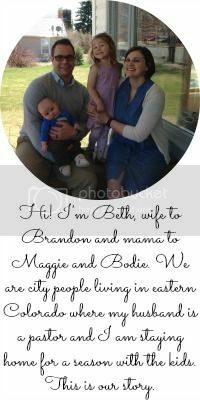 Hi Beth, I'm Bernadette.=) I live in Grand Rapids, MI. I both blog and tweet, though I really don't like tweeting too much. I am a wife and mom. I do lots of reading, and organizing, and cooking and keeping house, when I am not blogging. I love hanging out with my kids-taking walks and reading together. Nothing makes me laugh more than playing Wizzard as a family. If we met in person I'd love to drink a cup of coffee together, and eat a really chocolatly dessert. I agree Beth! you and I have only been blogging buddies for a couple months but I appreciate you. You know most from my blog, but for the sake of the post's questions: I love downtown Montreal, I LOVE to cook, bake, create, parent my kids, enjoy the city (usually without the kids, lol! ), and am deeply passionate about church planting, urban renewal, God's word, adoption, wives loving their husbands, etc. Hello! I'm Rachael and I live in south east Michigan although I'm originally from the UK. I moved over to the US to be with my husband after being in a long distance relationship for two years. When I'm not blogging I'm usually sewing, crafting or baking something or other in the kitchen or playing with our cats! If we met I'd probably suggest popping into a little patisserie! I live in Northwest Seattle (about 9 miles from downtown) in a little bungalow with my husband and Nesby the naughty corgi. When I'm not reading/writing blogs, I'm sewing for the shop or at work-- doing marketing stuffs for good ol' Zillow.com. I also like to run, love to cook, LOVE to thrift shop and read old fashioned print books. Hi Beth! I'm Brandon. I'm originally from Tennessee, but live in Brockton, MA, just south of Boston with my awesome blogger wife (you just might know her). So fun, Beth! I'm Angie, an almost 23-year-old girl living under the cotton candy skies of Utah with my gorgeous best friend, wife and soul mate Jen, our kitties Wedge and Mau and our cockatiel, Jango! When I'm not being a blogaholic, you can often find me: spending time outside, especially in the water and at night; playing World of Warcraft, The Sims 3 or a game on our Wii, drawing digitally, practicing my crochet, reading a magazine or book and always, always hanging out with Jen. We've been together, side-by-side, for the last five years and it's WONDERFUL for us! If we ever met in person, I'd definitely take you to The Melting Pot, which is a restaurant that revolves around FONDUE of all sorts!!! GAH!!! Hey! My name is Nadine and I live in Vancouver, BC up in Canada. When I'm not blogging I work for a non-profit that support youth. I blog (www.nadinewouldsay.com) and tweet(@nadinewouldsay)! Yay! Let's go for coffee! I LOVE coffee. If you're not a coffee drinker, maybe you can grab a tea. You can come up to Vancouver because we've got some sweet coffee shops up here. Then maybe we could either sit and chat about life or walk and chat. Hey! I'm Julia. I live in the twin cities--specifically St. Paul MN. When I'm not blogging I take care of my two kiddos, one of which was recently diagnosed with autism (which I haven't talked a ton about on my blog--still figuring that out), checking out my favorite thrift stores, meeting with friends from church. Summer: punch pizza on grand ave, fun outdoor seating. Winter: tons of coffee shops! Thanks for introducing yourself :) I would love to visit St Paul. I've only been to the airport, but that doesn't really count, right?! I would love to check out some thrift stores and coffee shops!